Nexon (CEO, Park Jiwon) will host a special event that provides a wealth of benefits for the 14th anniversary of its service, 'MapleStory', a popular online game that is being provided by the company. First, on April 29, according to the cumulative record of the day game connection, 'Galaxy Star Exchange', '14th anniversary Sugar Box' to provide the 'Sugar Time' event. Also, when you create a new character until May 24th, you will be given a "mysterious secret box" and a "legendary secret box" to give the character designated as "mega-burning" to conduct 'Mega Burning Project'. During the same period, we will show a new map to enjoy various mini games and benefits such as 'Blessing Star Vita Planet'and 'Planet Minel: Extreme Race' in the same game. In addition,'Stardust Point', 'Special title' and so on. In addition, from 10 am on May 11 to June 21, 'Pink Bean' limited to perform a variety of missions to receive compensation, 'Pink Bean Secret Diary' will be showing. During the event, you can create 'Pink Bean' with cute looks and new skills. For users who achieve Level 100, 'Pink Bean Potion' and 'Pink Bean Experience'. In addition to this, there are various 'Map Like Like Space' including '14th Anniversary Achievement Event', 'Maple Galaxy Academy', 'Sunshine Maple', 'Premium PC Room Event' The 14th anniversary event offers a lot of benefits. 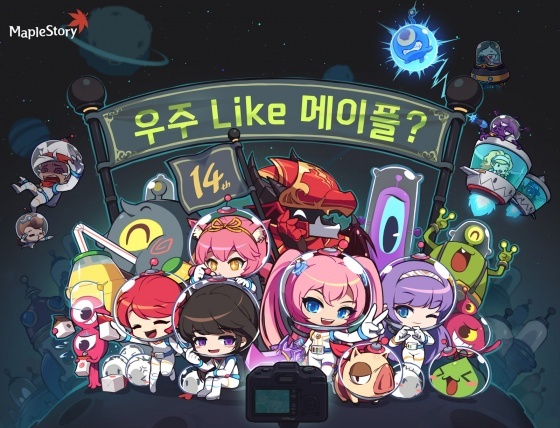 A new patch has been released celebrating space-themed 14 years of MapleStory. This patch also contains a ton of QoL updates from the Voice of Mapler initiatives, skill balancing, and other updated features.